The Baleno debuted as the iK-2 Concept way back in 2015 at the Geneva Motor Show. Maruti Suzuki has given the hatchback a subtle update now, which deviates ever so slightly from the concept. There’s a new bumper that appears sportier, courtesy a revised enclosure for the foglamp and sharper creases. The grille has grown in size, and the layered e ffect looks posh too. Over to the sides, you’ll notice a set of new machine-finished 16-inch alloy wheels. A minor update comes in the form of LED lighting that replaces bi-xenon setup in the projector headlamps. With the RS variant, you get a sportier body kit that hopes to show-off the Baleno’s sporty side. Inside the cabin, the Baleno continues to feature a blue-black interior theme. The silver accents on the dashboard are now darker too. This, we feel, is a refreshing change from the beige-black setup most of its contemporaries use. It’s among the most spacious cabins in its class too, with rear seat kneeroom managing to eke past a few C-segment sedans as well. Yes, the small windows might make you feel hemmed in at times, but that’s not really a deal-breaker in our books. You also get 339 litres of boot space, which is ample for a modern nuclear family. But remember that the opening is high off the ground and narrow, so you’ll end up working the lower back while loading big or heavy luggage. In terms of features, Maruti Suzuki has changed the touchscreen on the top-spec Alpha variant. It’s still a 7-inch unit, but it’s the new ‘SmartPlay Studio’ unit we’ve seen in the new WagonR. Developed by Harman, this screen too supports Android Auto and Apple CarPlay. Other features include a 6-speaker music system, automatic climate control, puddle lamps, a coloured TFT screen for the MID, and automatic headlamps. As far as safety is concerned, you get dual airbags, ABS with EBD, and ISOFIX child seat mounts as standard. 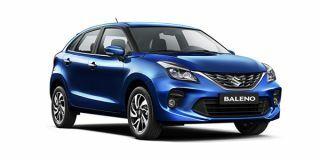 The 2019 Baleno also gets seatbelt reminder, a speed alert system, and reverse parking sensors as standard across variants.